Call Boat Owner Thomas 407-401-1581. Description:Classic 1959 Mahogany wood boat in restored condition. The Ford Intercepter inboard motor was completely rebuilt with all new peripharals, and has only 6 hours. 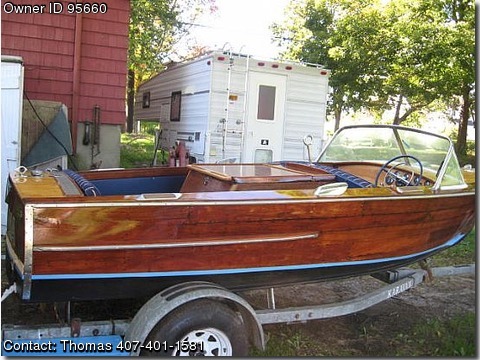 Comes with anchor, 2 bilge pumps, Coast Guard pack, compass, full new Teleflex gauges, spare original gauges included, teak flooring, new Sunbrella upholstery, mooring cover, rod holders, storage, ladder, prof. maintained.